All the ugliness I see on the news makes my heart sink. We each have the right to feel the way we do. I may not agree with you, and you may not agree with me and here’s a secret: That’s OK!! But I wish we could all practice a little more tolerance for opinions that differ from our own and show a little more love toward our fellow humans. What a wonderful world it would be! It seems everyone needs a reason to be outraged these days about something – almost anything! Then others jump on the bandwagon ‘just because’ – thinking perhaps they should be outraged too… (smh) Hot topics sometimes trigger the passion we feel to overshadow the feelings of others, and sometimes even common decency in our response. I pray for a gentler world where we can all live together doing the things that are important to us, while our neighbors tend to things that are important to them. We’re not all carbon copies of each other, and that’s a wonderful thing. 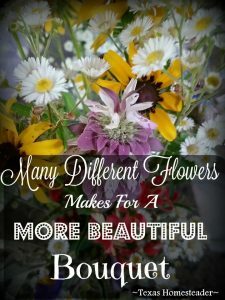 Remember, many different flowers makes for a more BEAUTIFUL BOUQUET! This entry was posted in Blog Posts and tagged Flowers, Inspirational on January 25, 2017 by Texas Homesteader. 100% totally, absolutely agree. I love the comment about a “time out”. If we don’t stop all this “in-house” bickering, we will never accomplish one thing. Why does it seem to be about “me” lately, and not “us”? And yeah, I’d like to say it’s time for people to “man up”, but I’d most likely get very negative remarks for it, so maybe I’ll say it’s time for people to “grow up”. But then I think about it, and why should I have to be that extremely careful about what I say? As you seem to have been. People are so “touchy”. People need to “get a life”, while they are protesting and arguing, people are starving, homeless, and in need of medical care. I think it’s called priorities. Tammy, ugliness is a good word for it all. I agree that peaceful protests bring attention to issues that need to be confronted, but then as you say, some have to push it and turn it into ugliness. And the sad part about that is, most folks will only remember the ugly parts, which defeats the purpose of the peaceful protest. Live and let live is how I try to be. I certainly don’t agree with most trains of though now a days, but then I don’t expect everyone else to bow to my thoughts. It seems like all thoughts of respect and consideration for others has gone by the way side. And it does make me angry that I have to feel like the other person can and will say what they want but if I do so, I’m the bad guy…oops, I guess I should be politically correct and gender neutral and say person 🙂 So now a days I tend to keep my mouth shut when I really don’t want to. Thanks for listening and thanks for for allowing our comments. Have a great day! So true, and thanks for posting this today! Its gotten so bad, its driven me off of Facebook and other sites that I usually go to. I often think it’s because some people just don’t have enough to do == so I’m using the extra time I now have spent starting vegetable seedlings and cleaning up the garden in prep for spring. A better use of time, truthfully! Boy, if there ever was a time for “time out” it would be now. Diaper pins, safe rooms, etc….. give me a friggin break. It’s time to put on your big boy pants and grow up. Sorry to sound so angry but I’ve had enough already. The situation by me has gotten so bad that we have had signs posted ” Heaven won’t accept you and hell’s afraid you’ll take over” posted in people’s yard that voted for Trump. My county gives out info on who is registered to what party. I can only imagine what would have happened if Obama would have had protesters the day after his swearing in. Tammy, have a blessed week and Happy New Year, Patti. Ahem, let people calm down and the weather too.